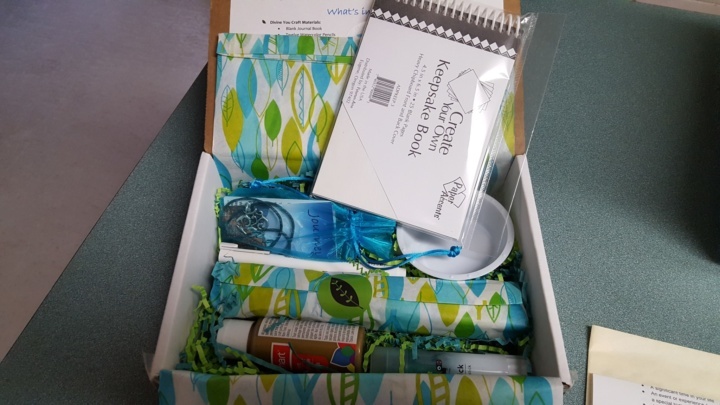 Divine You Crafts is a monthly subscription box that sends you arts and crafts items so you can craft about your life. 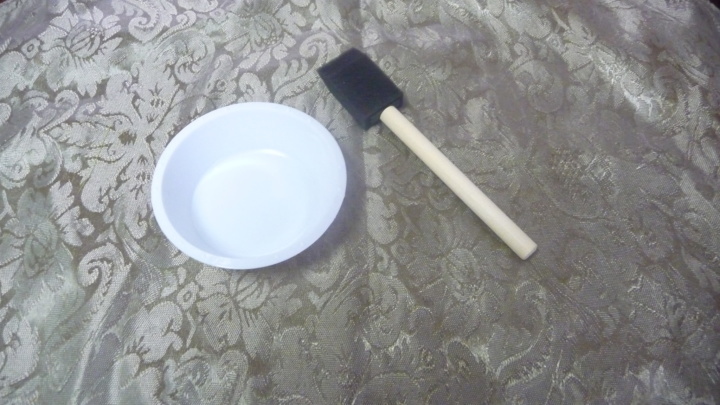 It features a seasonal craft or tool to make, a crystal or stone, and our gift to you, a collectible Divine You card. 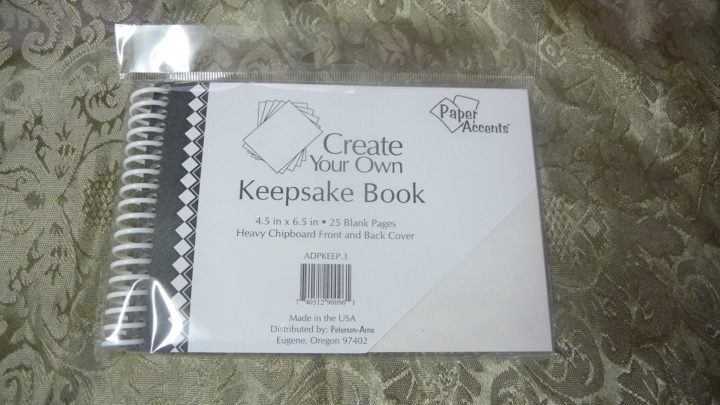 For only $39.95 per month, you can make beautiful and meaningful keepsakes while gaining insights and inspirations. July’s box allows you to express yourself in an art journal-a visual diary that you can put in sketches, collages and other art forms. My box had a bottle of gold paint, a sponge paint brush, 2 regular craft paint brushes, an blank ink marker, water color pencils, glue stick, paper for collages, a stencil, water bowl, inspirational cards, a stone, a scrap book, and a necklace. 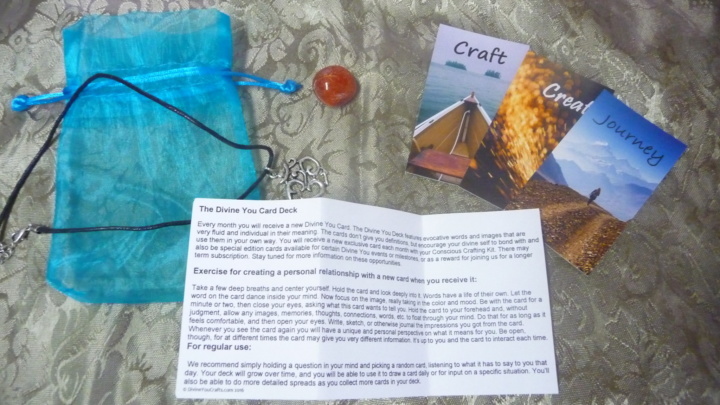 Also included is a pamphlet on what is in your box that gives you direction, explanations behind the stone and inspirational cards, and information on the company and a featured maker. I like to express myself in art so I got straight to work on trying out this box. First I started with the scrapbook. 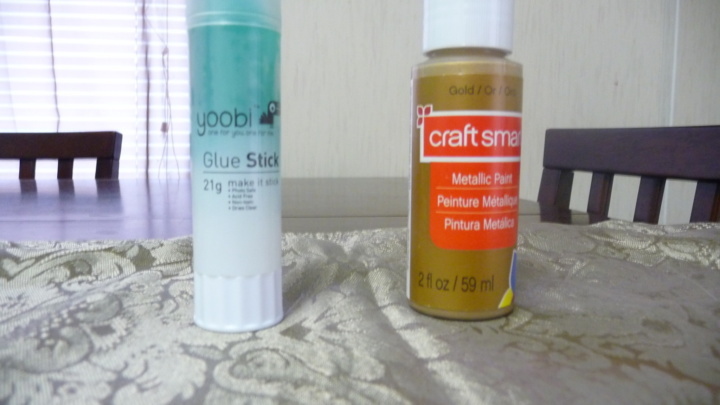 I used the sponge brush to paint on the gold paint that came in the box. The design came from the stencil that was included. Isn’t cute?! Just decorating the front made me feel a bit better. I was having a bad day. After the paint dried, I started on my first page of the scrapbook. 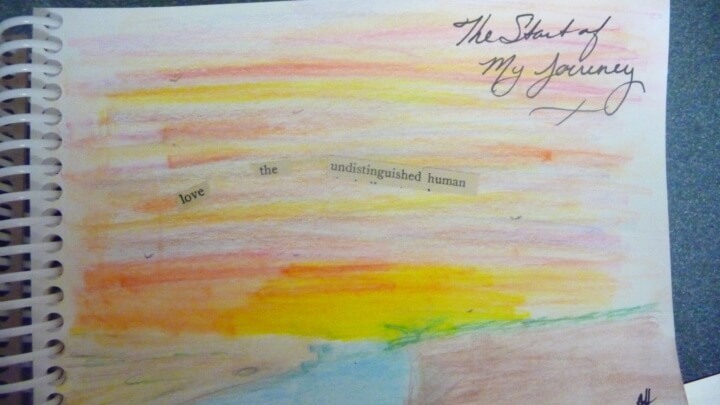 I used the watercolor pencils that were in the box and the some of the collage sheets to make my drawing. I have never used watercolor color pencils before. These are so cool. 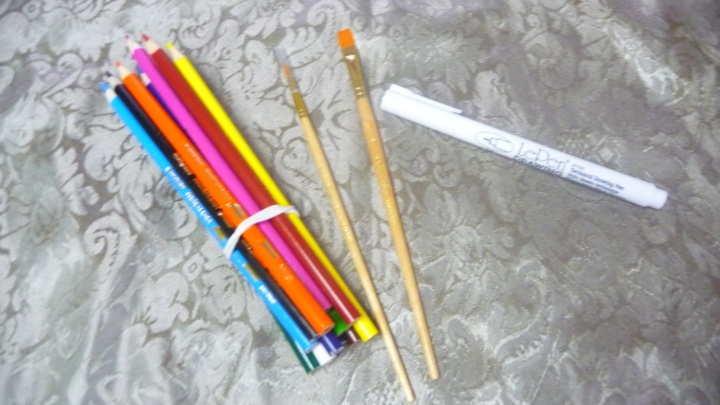 You color just like a regular color pencil but then you can take a small paint brush dipped in water and turn the colors into paint. Squeal!! Here is my first sketch that described my mood. What do you think? Am I budding artist? Lol! On to the inspirational cards and stone. This month’s card was the word JOURNEY. It is to express where you been, where you are and where you are going. I took this word and made it theme of my drawing. I would love to be sitting on a beach and watching the sun go down with a Mai Tai in my hand. I also received 2 additional cards: CRAFT and CREATE. Two more words that have a lot of meaning in one’s life. The stone this month is an orangish brown stone called Carnelian. It is said to give one the courage and confidence to move forward on a new path in life. Also in the box was a cute little OM necklace with a unique design (this was a box extra – but you can get it free with the coupon). I love it all. This box came at the right time for me. I am looking for a new path and courage. I hope you enjoy your box as I did mine. Oh yeah, Good Luck on your Journey! 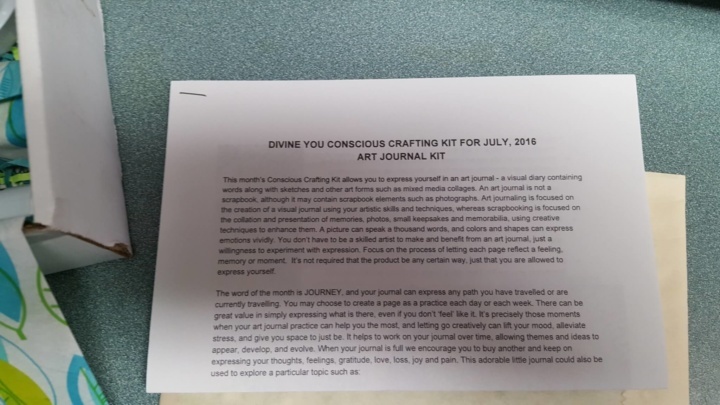 Will you be trying Divine You Crafts? Visit Divine You Crafts to subscribe or find out more! Get a free OM pendant necklace in your first box. Use coupon code HSNECKLACE. 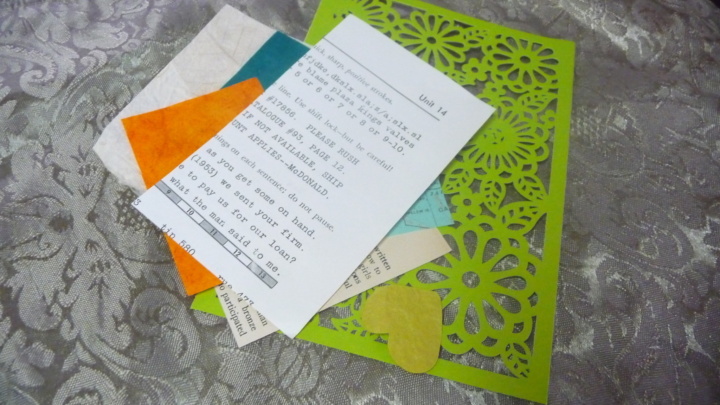 The Description: Part craft lesson, part soul work, part fun! We Inspire creative spiritual seekers to make meaningful and beautiful keepsakes while gaining insights and inspirations. 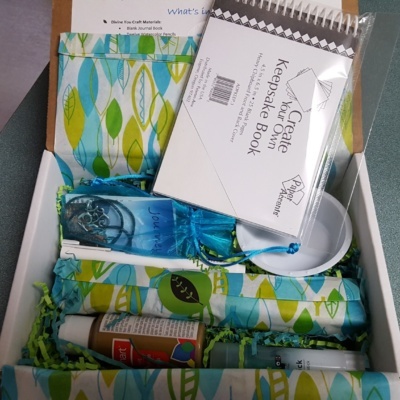 Each month’s box will feature a seasonal craft centered around an inspirational word and including a ritual or other experience. We also give you a special crystal or stone, as well as one of our exclusive collectible Divine You cards so you can build a deck.Our focus is on the insights gained in the process of creating, rather than on the finished product, so makers of all skill levels are encouraged to participate. Often these keepsakes become cherished because of insights gained, or because the allegedly creatively challenged person created something so meaningful even as they doubted their own creative abilities. See Divine You Crafts in the Hello Subscription Box Directory! The Categories: Crafts, DIY, & Hobby Subscription Boxes. 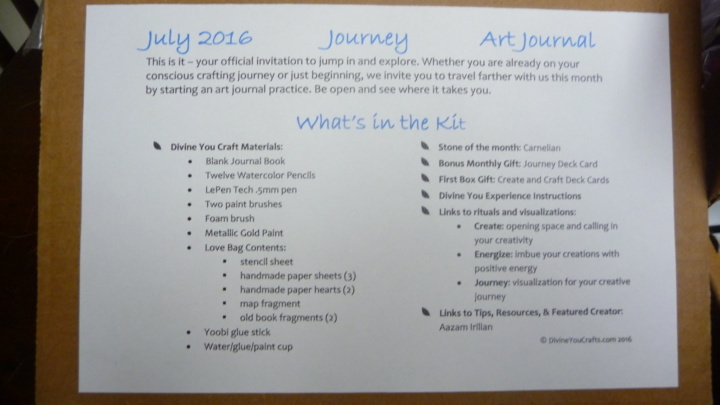 Craft Kit Subscription Boxes, New Age Subscription Boxes, Subscription Boxes for Mindfulness and Meditation. 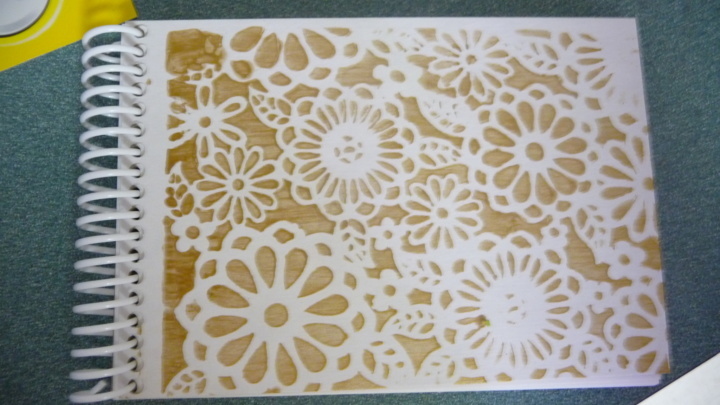 Part craft lesson, part soul work, part fun! We Inspire creative spiritual seekers to make meaningful and beautiful keepsakes while gaining insights and inspirations. Each month's box will feature a seasonal craft centered around an inspirational word and including a ritual or other experience. We also give you a special crystal or stone, as well as one of our exclusive collectible Divine You cards so you can build a deck. Our focus is on the insights gained in the process of creating, rather than on the finished product, so makers of all skill levels are encouraged to participate. Often these keepsakes become cherished because of insights gained, or because the allegedly creatively challenged person created something so meaningful even as they doubted their own creative abilities. Get a free OM pendant necklace in your first box. Use coupon code HSNECKLACE. 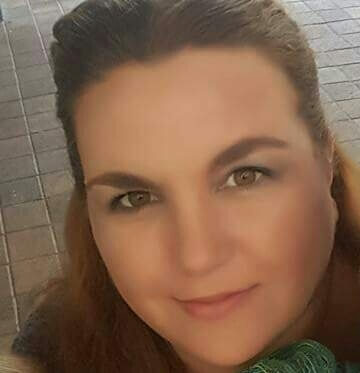 Just a hardworking single mom who likes to try new things. Whatever doesn't kill you, makes you stronger. Lol! Oh this is exciting. Good luck on your journey.